And now back to your regularly scheduled blogging! It's Saturday of a long weekend, YAY! I thought my last post was my last mani I did while on vacation, but it wasn't. I did one more. This is Above the Curve Fallen Angel 2.0. I received this in the nail mail package that I won from them. This is so pretty. I didn't even catch all it's beauty in these pictures. There is some blue micro glitter in there that I just couldn't get. Please excuse the bad hotel room lighting, but even with that I thought the pictures came out ok. 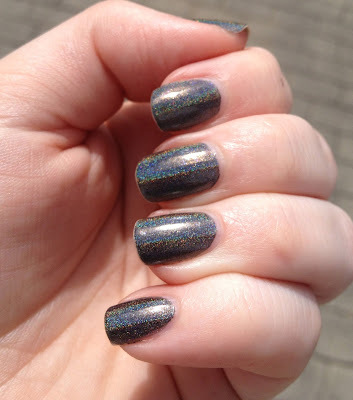 Even in such low light the holographicness of this polish was great. I was able to wear this polish for four or five days with minimal tip wear and no chips. I used my usual base coat of Duri Rejuvacote and used three coats of Fallen Angel 2.0 and topped it with Glisten and Glow HK Girl topcoat. As for the dog I mentioned in my previous post, just in case anyone was wondering. She is doing ok. The vet said that she had a couple weeks but it was going to be fast for her. Right now she is still here with us, still eating (although we have to make accommodations for her due to the size of the tumor on her jaw) and drinking and going potty. We will try our best to keep her comfortable and happy until the end. This is so much harder than I ever ever thought it was going to be. I'm getting in my snuggles now while I still can.